The more you think you see, the easier it'll be to fool you. Are you ready to participate in the Diamond Heist Challenge in promotion of Louis Leterrier's Now You See Me? We've got an exclusive card below. In this magical challenge, all thirteen diamond playing cards – from the Ace through the King – have been hidden in various places online, from various websites to social media platforms, even in the NY Times crossword puzzle from Friday, May 3 (your first hint!). The "hidden" playing card clues will unlock exclusive video through an app called Blippar (yea, I know, more promotion) but it's for a cool movie. 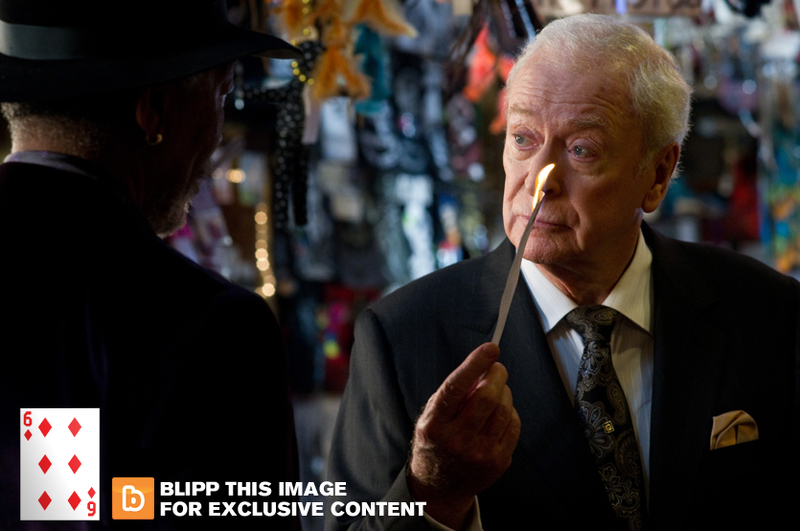 We get to debut this new photo with Michael Caine seen below - which may contain the diamond clue you're looking for. For more on the Diamond Heist Challenge, visit the official Now You See Me website with details and clues. Be sure to check the NYSM Facebook and Twitter pages for hints as well. And watch the latest trailer here. This movie looks a lot like JUMPER. Maybe Caine and Harrelson will make it better?